Long gone are the days where online videos are just for watching Fluffy or the box-loving cat, Mugumogu’s antics. While “catvertising” was an ingenious idea and there never could be too many cute and ridiculous animal videos, we should also recognize that web videos are used for far greater purposes these days, including: training, education, advertising, sales, corporate promotion, etc. In fact, according to a study by Forbes, Video in the C-Suite, 80% of C-level executives surveyed reported watching more videos than even one year ago, and 65% noted having visited a vendor’s website after watching a video. Today, the corporate overview brochure is being replaced (or supplemented) by the corporate video piece. 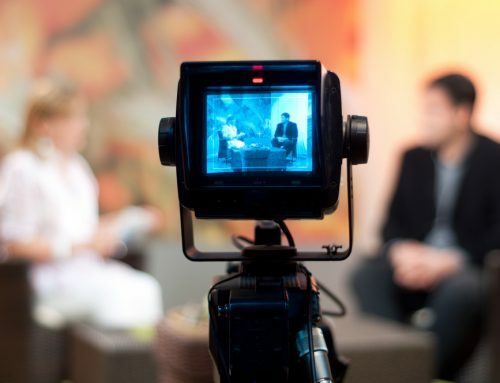 Videos, when done by a professional video production firm, offer a greater level of engagement and instant gratification than a traditional brochure. Not to mention, prospects have so many more ways to learn about your products and services. An engaging video of your company’s overview can be promoted in any number of places including your company website, YouTube, LinkedIn, social media channels, and email, just to name a few. Length: The value that a video brings to the table is not determined by its length. Unless you’re giving away a free, 3-day Vegas vacation after watching the hour-long corporate promotion (and even then they might not be able to endure), prospective customers will likely flip back over to Facebook or Twitter long before you’ve gotten to the point. Actually, according to a study done by Wistia, the completion rate for a 30 sec video was 90% and it dropped to 50% for a 2-3 minute video and then trend continued downward. Front-Load Content: Because we’re all so busy, it’s important to incorporate value statements and your call to action toward the beginning of the video. Meaningful content: Time is limited. Business and marketing buzzwords may sounds great, but what are they really saying about your business and what you can offer? Video is a powerful tool. If done correctly and promoted well, a corporate video production can help drive your business forward and increase your market-share. If you don’t do it right, you’ll be wasting your money and potentially hurting your reputation. Remember, when all else fails, get a cat. Need help with your corporate video production? To learn more about our video production services click here. To speak with someone about your project, or to request pricing, please click here.